Your house will smell amazing when you cook this! 1. Pour apple cider into a 2.5 quart or larger crock pot or other slow cooker. Stir in honey. It may remain clumpy; that’s okay. It will dissolve when the mixture heats up. 2. With a toothpick, poke holes in the orange, about 1/2 inch to 1 inch apart. Carefully stick the cloves, pointy end down, into the holes. 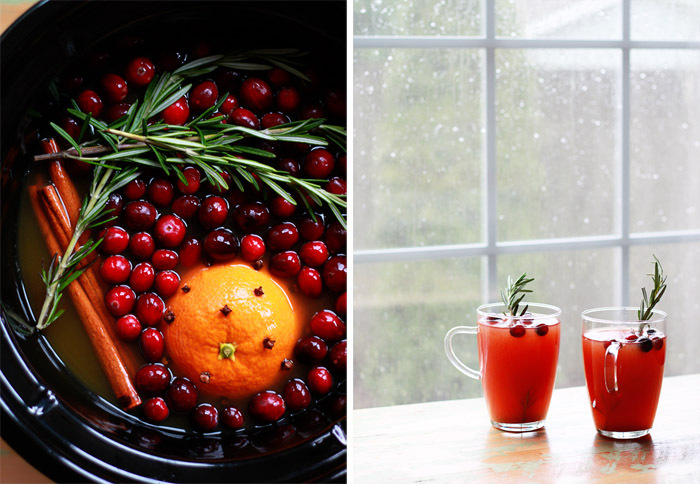 Add the orange to the cider along with the cranberries, cinnamon sticks, and rosemary. Push the rosemary down to help make sure it’s submerged. 3. Cook on low until hot and the cranberries have started to burst, 3-4 hours, taking care to not let the cider boil. Very carefully with a fork or masher, gently crush the remaining cranberries to pop them. They might splurt, so be careful! This will help to get as much flavor out of them without overcooking the cider. 4. Strain the mixture through a fine-mesh sieve into a large bowl. Add the strained cider back to the crock pot. You can also add the cinnamon sticks and orange back, as well, for a festive touch. Discard the remaining solids. Serve immediately or keep the crock pot on the warm setting to keep the cider hot. 5. Garnish individual mugs of cider with additional fresh rosemary sprigs and fresh cranberries, if desired. The strained mulled cider can be refrigerated overnight. Reheat before serving. You can also add Chardonnay or a dark rum for spiked flavor. Try this delicious drink at our Open House on November 14 & 15. 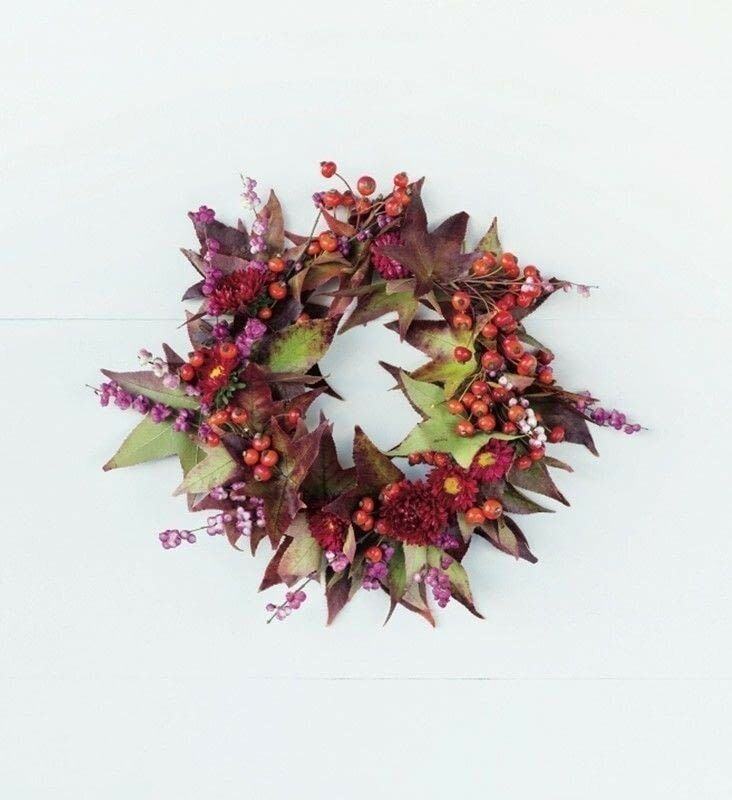 Star-shaped leaves and bright berries form a petite ring of autumnal fireworks. 1. Start with the wire wreath frame. Gather a variety of the listed ingredients to create a small bundle. 2. Attach the bundle to the frame with paddle wire. Gather a second bundle and attache it on top of the first with paddle wire. 3. Continue making and attaching bundles, slightly varying the number of each ingredient. Trim any stems that extend too far off the frame. 4. Tuck the stems of the final bundle under the first bundle. 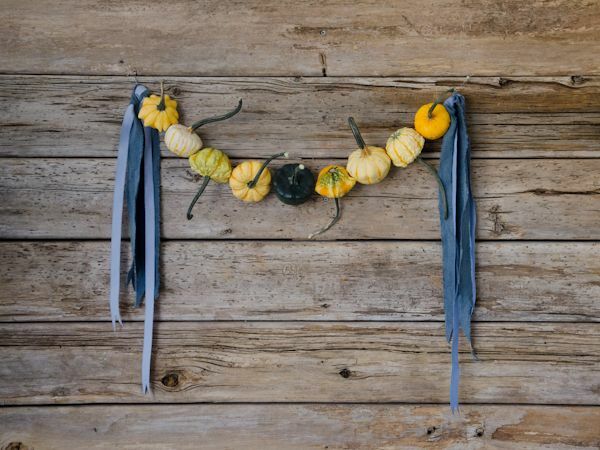 Get your gourds off the ground and present them in a new light as garland. 1. Drive the heavy-gauge needle threaded with heavy-duty fishing line through the gourds, using a hammer to tap it through if there is too much resistance. Leave 6 inches of fishing line at each end. 2. 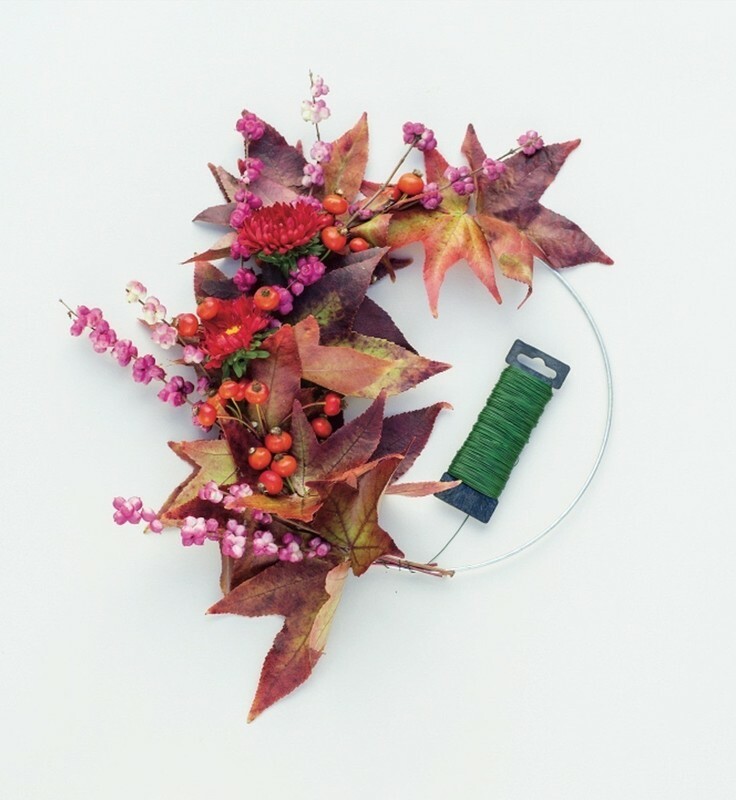 Attach the garland to the wall using nails, and tie three pieces of ribbon to each end of the garland to conceal any exposed fishing line. You can do this fun DIY with any plant you wish! 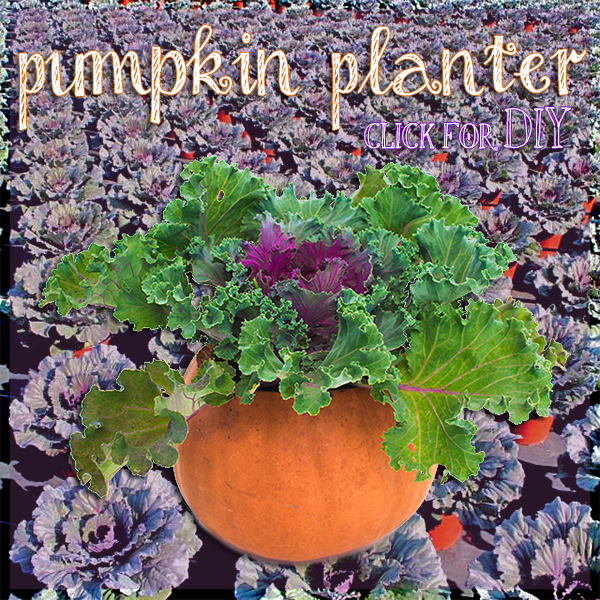 Your neighborhood Johnson’s has has hardy fall mums, asters, pansies, cabbage, and more! Don’t fall short – now is the best time to seed and feed your lawn! 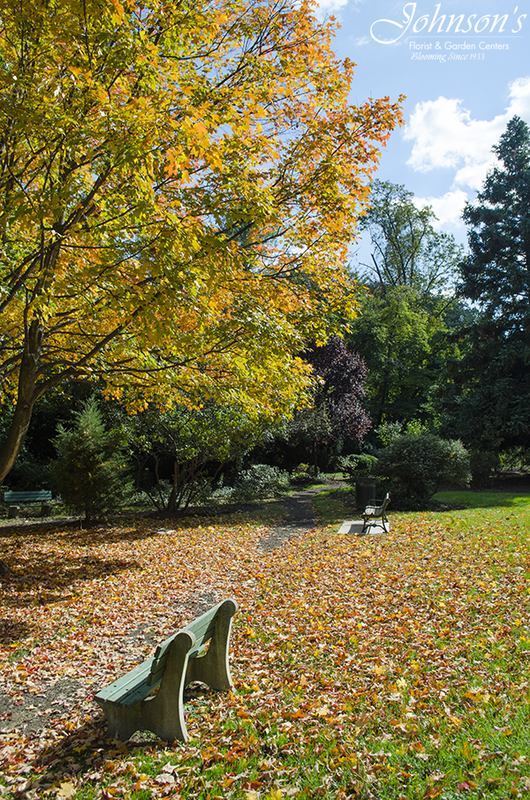 Starting now will help your lawn come back healthier and even more beautiful next spring. 1. Mow and rake the lawn and apply a starter fertilizer. Johnson’s recommends Scotts Starter Fertilizer. 2. Johnson’s recommends a high quality tall fescue seed mix. Tall fescues will grow in a very wide range of sun exposures and soils. Johnson’s carries our own blends of grass seed formulated for the Washington Metropolitan area. 3. Cover the reseeded area with Greenview Seed Accelerator or DeWitt Straw TakSack. This is a clean and efficient way to keep the seed moist and help it germinate faster. Straw TackSak is designed to stop erosion and promote germination. 4. Keep the area moist, checking it in the morning and afternoon. Do not allow the seeded area to dry out while the seed is germinating. Johnson’s has a complete line of hoses, sprinklers, and timers to help you with this task. 1. When you get to your final mowing of the year, mow the lawn just a bit shorter than usual. 2. “Sweeten” the soil in mid-fall with pelletized lime. 3. Rake up leaves or use a mulching mower to shred them. You don’t want leaves smothering your lawn during the winter, but shredding leaves turns them into a nourishing compost. 4. Use a high quality, slow feeding, organic lawn food specially formulated for this time of year. We recommend Espoma Fall Winterizer – it contains extra potash to help your grass survive the winter. 5. Look for bare spots in your lawn and reseed. Be sure to allow enough time for the seed to establish before winter arrives. To reseed small areas and repair bare spots, we recommend using Scotts EZ Seed for tall fescue lawns. 6. Pull all those pesky weeds. 7. Irrigate as needed, but keep in mind that you’ll need less water for your lawn in fall. Find more Lawn Care information on our Tips & Info page.